Although there are no government-sanctioned safe injection facilities (SIFs) in the U.S., this concept is being tested in several other countries. 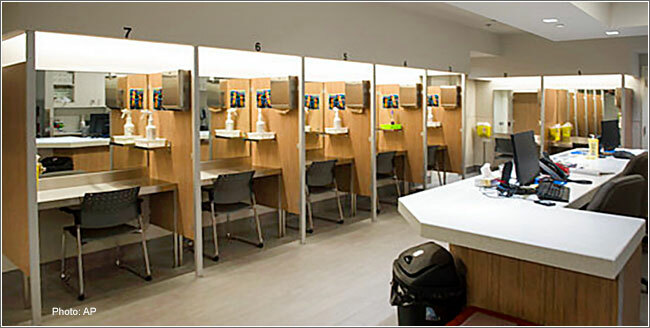 Above is a safe injection site currently operating in Montreal, Canada. University of Pennsylvania researchers are working to develop a way to evaluate the facility that Philadelphia plans to open. A University of Pennsylvania research team funded by a working group grant from Penn's Leonard Davis Institute of Health Economics (LDI) is beginning work to support Philadelphia government's new efforts to develop, launch and evaluate the country's first government sanctioned Safe Injection Facility (SIF). Both LDI's grant and the City's larger plans are a response to the extraordinary public health emergency caused by the current opioid epidemic. Douglas Wiebe, PhD, Penn's Perelman School of Medicine and LDI Senior Fellow. The grant, one of twelve announced by the Institute this year, was awarded to Penn's Center for Public Health Initiatives and principal investigator Douglas Wiebe, PhD, Associate Professor of Biostatistics and Epidemiology at the Perelman School of Medicine and LDI Senior Fellow. Established nearly five decades ago to support its Senior and Associate Fellows' initial analyses of important health services or policy research questions, LDI's annual small grants program has funded a broad variety of public health investigations in areas including HIV/AIDS, Hepatitis C, obesity, and health care disparities. The grants are available to Senior and Associate Fellows across all of Penn's Schools. For instance, 13 of the 32 primary investigators or co-investigators on this year's projects are from the Nursing School. Others are from Penn Medicine, Wharton School, School of Arts & Sciences, and Law. The SIF evaluation grant is also the latest in a number of other LDI collaborative initiatives and individual senior fellow research projects focused on the extraordinarily deadly opioid crisis. Now one of the country's largest metro markets for heroin, Philadelphia also has the highest drug overdose death rate of any major U.S. City. Last year's local drug overdose mortality count was around 1,200, or more than 3 people a day, every day. Safe injection facilities, also known as supervised injection sites or comprehensive user engagement sites, are government-sanctioned, medically staffed programs that enable drug users to inject themselves in a safer manner in close proximity to overdose reversal medications, medical care and some level of social services and encouragement to seek drug use cessation treatment. Other local governments in Seattle, San Francisco, Baltimore and Denver are discussing the creation of such safe injection sites; proponents point to Canada's long-sanctioned SIF approach to drug use issues. That country began authorizing such facilities in 2003. However, there are few definitive evaluation findings about the impact of such services on regional overdose mortality rates, blood-borne virus spread or associated crime rates. "I think everyone involved in this is moving into new research territory," said Sara Solomon, Deputy Director of Penn's Center for Public Health Initiatives which received the LDI working group grant. "The most immediately useful thing we can do is to identify sound methods for evaluating exactly how these injection services could benefit both drug users and the surrounding communities that are struggling with this public health emergency." At the beginning of a researcher's career, these pilot grants can be very meaningful to jumpstart new research but the long-term impact may often be harder to realize at that stage. Pilot projects like this are a form of "proof of concept" support for research ideas. LDI's grants have annually funded its senior and associate fellows' exploratory investigations that otherwise might have been unable to qualify for funding from NIH or other traditional sources. Pilot project grants are usually $20,000 or less. Working group grants are usually $10,000 or less. Often, the grants enable researchers to do first-round work that subsequently lands them in academic journals or are crucial to their success in acquiring NIH funding for a larger project. One example of how this works can be seen with Penn Medicine Professor and LDI Senior Fellow Mitesh Patel's 2014 LDI pilot grant project, "Using an Intervention in the Electronic Health Record to Nudge Physician Ordering and Patient Completion of High-Value Preventive Care Services." Patel, MD, MBA is an Assistant Professor of Medicine and Health Care Management at the Perelman School and The Wharton School, and a physician at Philadelphia's Crescenz VA Medical Center. His proposal to LDI involved how the University of Pennsylvania Health System electronic health record (EHR) system designed for internal medicine ambulatory practices might be altered to influence physicians to be more aware of the preventive services patients had not yet received. The goal was to increase physician surveillance of and ordering of those preventive services. 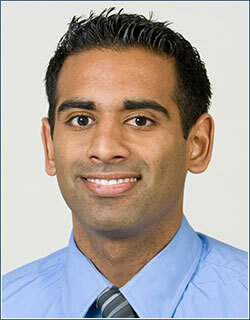 Mitesh Patel, MD, MBA, Perelman School and LDI Senior Fellow. The work resulted in findings that were published in Healthcare: The Journal of Delivery Science and Innovation in 2016. The methodology developed in that first pilot led to another project and article published in the Journal of General Internal Medicine in July of 2017. In September of 2017, as a direct result of his previous pilot project-rooted work, Patel was awarded a $217,000 National Institute of Aging grant for "Leveraging the Electronic Health Record to Nudge Clinicians to Prescribe Evidence-Based Statin Medications to Reduce the Risk of Cardiovascular Disease." "The LDI pilot was really important to me," said Patel. "It helped generate the pilot data needed to further develop my work, leading to both new ideas and grant proposals." "At the beginning of a researcher's career," Patel continued, "these pilots can be very meaningful to jumpstart new research but the long-term impact may often be harder to realize at that stage. It's not until later when looking back at how the pilot data lead to further growth in your research career that it becomes more apparent." In his application for a 2015 LDI pilot project grant, Penn School of Arts and Sciences Professor Hans-Peter Kohler focused on the Survival and Disease Perceptions (SDPs) of HIV/AIDS patients. Previous research had found that patients with such serious ailments often develop perceptions that are skewed in ways that make them overly pessimistic about their own survival and care. These often-distorted perceptions, in turn, can affect mental health and influence a range of other behaviors that have serious health implications. Kohler, PhD, is Professor of Demography whose research focuses on health demography and social change. 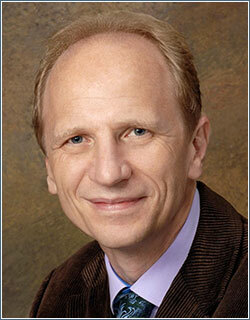 Hans-Peter Kohler, PhD, Penn School of Arts & Sciences and LDI Senior Fellow. His pilot grant proposal was entitled "The Benefits of Knowledge - Mortality Risks, Mental Health and Life-Cycle Behaviors" and the LDI-funded work was instrumental in getting two NIH grants in 2017, he said. The first was a $207,294 National Institute of Aging grant for a larger "Benefits of Knowledge - Mortality Risks, Mental Health and Life-Cycle Behavior" study in July of 2017. The second was the National Institute of Child Health and Human Development grant, "Surviving an Epidemic: Families and Well-Being, Malawi 1998-2020" for $629,339. 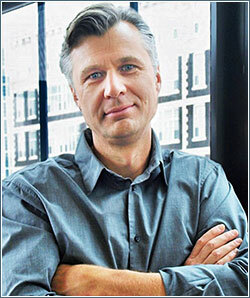 "In any ongoing projects," said Kohler, "it's essential to innovate and 'think outside the box'. Pilot funds allow one to explore 'risky' research projects, and generate preliminary data on projects that are related to existing funding, but are outside of the scope that presently funded research. So, in short, the LDI pilot was very important to keep the momentum and develop this idea on "the benefits of knowledge". "Young researchers moving into health research are increasingly aware of the need to raise funds," Kohler continued. "I suspect many underestimate how competitive the grant process has become on the NIH side and how pilot funds can help or be critical in this process. I've also found the pilot grants important for networking. LDI's funding of part of our research strengthened my ties to LDI and gotten me more involved and benefited from the different sets of connections and expertise available through that Institute."